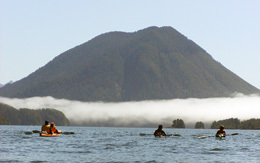 World-renowned Clayoquot Sound is a paddler’s paradise. Situated on the spectacular west coast of Vancouver Island, it is an area of vast diversity and beauty; wild sandy beaches, lush green-forested islands, and deep inlets surrounded by snow-capped mountains. Meet at the launch site in Tofino for 8:00 am. Upon your arrival, we will show you how to effectively pack your belongings into your kayak. We'll spend time familiarizing you with your kayak as well as introducing basic paddling skills, and safety procedures. Once on the water we’ll make sure you are comfortable and secure before setting off. Note: Due to the exposed beaches and tidal currents found in this area we will review how these conditions will be handled. We will choose to land only on beaches with manageable surf, and we will plan open water crossings during slack water. Clayoquot Sound is the gem of the West Coast. The unruly combination of forest and ocean illustrates Nature's incredible imagination. The wild, twisting shoreline often gives way to long, white, sandy beaches. Logs hurled high on the shore during winter storms, become sun bleached driftwood protecting the delicate wild flowers of the Beach Pea, the Sea Rocket, and the Indian Paint. Wolf tracks can sometimes be discovered meandering along a sandy beach, and there are always Bald Eagles perched high on Cedar snags, their presence signalled by their high pitched whistles. When the tide recedes from the rocky headlands, tidal pools are revealed filled with fascinating marine creatures and plants as varied and colourful as any on land. 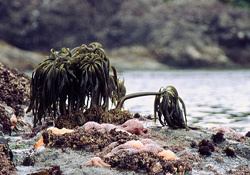 The intertidal zone is a place where many hours can be pleasantly spent, and we carry a number of reference guide books to help keep track of your observations. We'll spend the afternoon exploring the beautiful coastlines of Clayoquot Sound as we make our way to our first camp on Vargas Island. While the first evenings feast is being prepared, you may wish to take a stroll along the beach gathering pieces of driftwood for our evening campfire. At the end of an exciting day, gather around the campfire with your traveling companions and enjoy a mug of hot chocolate. Begin the day with a freshly brewed cup of organic coffee (or tea!) and a walk on the beach. After breakfast, we will journey out to enjoy whatever Nature has in store for us. The day's plans will be determined by the natural cycles of weather and sea conditions. 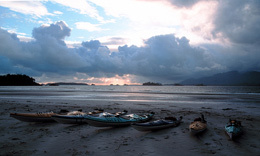 Our years of experience paddling in Clayoquot Sound has revealed many paddling routes. The rugged landscape of fjords, inlets, volcanic cones, and islands are shrouded by temperate rainforests. This complex ecosystem provides shelter and food for a variety of animals and fowl. Great Blue Herons, Loons, Auks, and many different Ducks, are commonly seen. Binoculars are highly recommended to help find some of the rarer species such as the elusive Tufted Puffin or Storm Petrels. Your kayak provides an unobtrusive vantage point from which to spot a number of marine creatures as we continue our exploration of the Sound. Gray Whales migrating north from winter calving grounds spend the summer months in this area grubbing along the bottom of the ocean sucking up shrimp-like crustaceans, tubeworms, and other tiny creatures. Dall’s Porpoise, Harbour Seals, or even the occasional pod of Orca (Killer Whales) may thrill us with their presence. As each day progresses you should find the paddling becoming easier and more natural as you gain experience and become familiar with your kayak. The waters of Clayoquot Sound provide for excellent learning opportunities. If you already have some experience kayaking you may wish to improve your paddling techniques, seamanship, or wilderness camping skills. You may be interested to learn how to interpret marine chart information, read tide tables, or how to navigate with a compass. We are always keen to share our knowledge, and to learn from you. Later in the day as dinner simmers, giant Sitka Spruce and ancient Cedar trees will beckon those unwilling to resist the earthy smells and quiet peace of the Coastal Rainforest. The majestic forests support an abundance of life forms. Below the canopy of the evergreens, an astonishing array of mosses, lichens, ferns, and shrubs thrive. Fungi and mushrooms depend upon the various stages of decaying forest material, displaying the richness of the life cycle. Evenings are often spent together conversing, playing games, or telling tales. A willingness to seek adventure with strangers and a love of nature soon bonds all the members of a group. And there's something about the combination of a camp fire and a night sky, so dark and starry, that leads to lively conversations. ***As an option we may at times choose to spend our last evening at west coast wilderness lodge ‘The Vargas Island Inn’. Please note that there are no extra charges in the event we stay at the lodge. 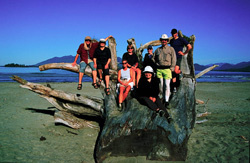 There is still plenty of adventure to be had between Vargas Island and Tofino. If the tide is low, we’ll enjoy paddling tight to the shore, to enjoy the view of the strange sea anemones, brightly coloured sea stars, sea urchins, crabs and a myriad of other fascinating creatures that will not be disturbed by our quiet kayaks. And of course, there is no shortage of wonderful spots to stop and enjoy a leisurely lunch before our return to Tofino. 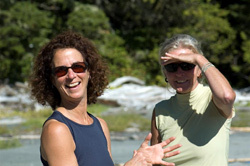 We plan our return to Tofino around 2:00 – 3:00 pm allowing enough time for those unable to spend the night in Tofino to reach other Vancouver Island destinations, or to board a ferry to the mainland. We will do our best to ensure that you will have the best sea kayak touring vacation possible. Customizing this trip to accommodate a group of friends, family members or colleagues can be arranged for 8 to 10 people. We are happy to discuss your ideas or make suggestions.